Contact pressure elevation is seen when articular incongruity is >3mm: <1.5mm shows no significant increase in contact pressure. (Brown, J Orthop Res 6:851, 1988). Knee pain following trauma. Inability to ambulate, tenderness over site of injury. Evaluate soft tissue injury. Auperficial abrasion / deep contusion / hemorrhagic blisters / massive swelling / skin wrinkles. Document neurovascular exam. Ankle-Brachial index <0.9 indicates need for Vascular Surgery consultation. ABI=systolic blood pressure palpated over the posterior tibial artery divied by SBP over the brachial artery at the elbow. Normal >0.9. Evaluate for compartment syndrome. Pain out of proportion or on passive stretch of the toes indicates need for compartment pressure monitoring. Monitoring is also indicated for an unconscious patient. A\P, lateral, internal/external oblique, 15 degree caudal tilt view. The degree of articular step-off is determined on the 15 degree caudal tilt view. Consider traction views for severe injuries. Increase in width of 1mm of medial or lateral clears space is suggestive of collateral ligament injury during stress views. Compare to opposite leg. CT scans with 2mm cuts and axial, coronal and sagittal reconstructions best identifies fx configuration. Best done in traction. Consider MRI to evaluate for associated meniscal and ligmanet injury (Yacoubian SV, JOT 2002;16:632). Displaced (>2mm, >10 degree angulation): ORIF. Generally ligamentotaxis reduction with depressed area elevated with bone tamps and packed with graft through fracture site or cortical window and fixation with peri-articular plate with multiple 3.5mm subchondral cortical "raft" screws proximally (Mills WJ, Orthop Clin North AAM 2002;33:177). Treatment is depended on the condition of the soft tissues. Consider spanning external fixation with delayed ORIF when soft-tissue permit for severe soft-tissue injury. Consider calcium phosphate cement augmentation of depressed segment (Trenholm A, JOT 2005;19:698). Type V-Bicondylar. ORIF. Generally ligamentotaxis reduction fixation with lateral peri-articular locking plate with multiple 3.5mm subchondral cortical screws proximally. Consider separate medial incision and plating. Treatment is depended on the condition of the soft tissues. Consider spanning external fixation with delayed ORIF when soft-tissue permit for severe soft-tissue injury. Type VI-plateau fractures with dissociation of metaphysis and diaphysis. ORIF. Generally ligamentotaxis reduction fixation with lateral peri-articular locking plate with multiple 3.5mm subchondral cortical screws proximally. Consider separate medial incision and plating. Treatment is depended on the condition of the soft tissues. Consider spanning external fixation with delayed ORIF when soft-tissue permit for severe soft-tissue injury. With Distal femur fracture: high energy in injury. 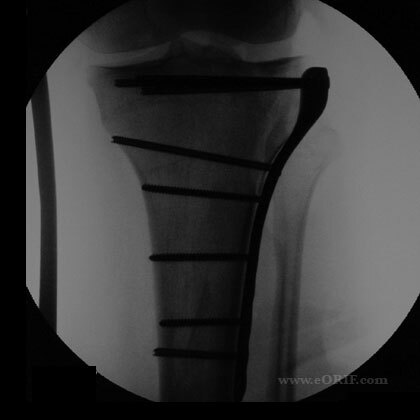 Consider temporary spanning external fixation with delayed ORIF. Parekh AA, J Trauma. 2008 Mar;64:736). DeBoeck and Opdecam, Posteromedial tibial plateau fractures: operative treatment by posterior approach. CORR, (320):125�128, 1995. 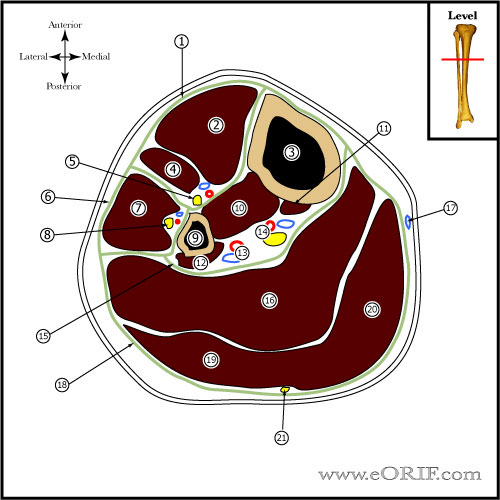 DeBoeck and Opdecam, Posteromedial tibial plateau fractures: operative treatment by posterior approach, CORR, 320: 125-128, 1995. 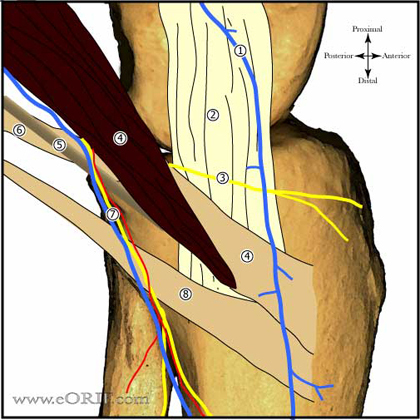 Georgiadis, Combined anterior and posterior approaches for complex tibial plateau fractures, JBJS Br, 76(2): 285-289, 1994.